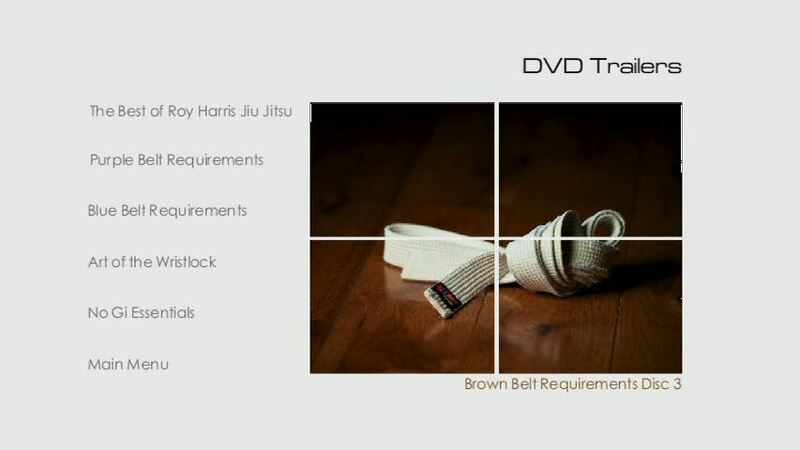 Short Review: If you're an experienced purple belt, there is now a DVD set aimed directly at you, with the intention of suggesting some ideas to help you develop into a brown belt. 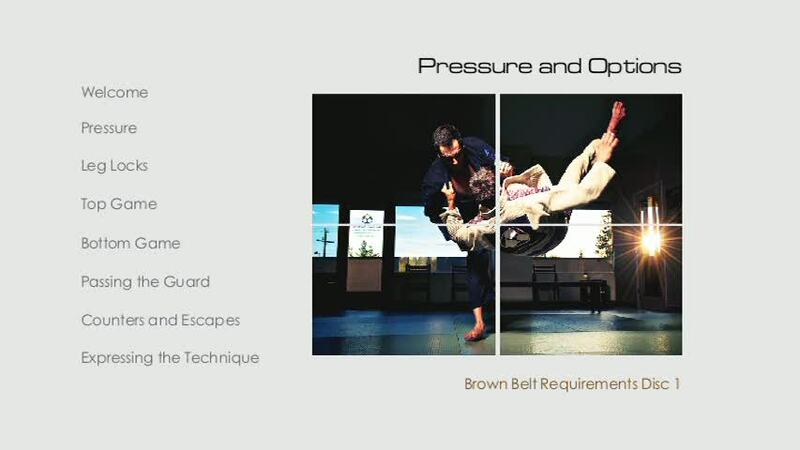 As in Purple Belt Requirements, a concept lies at the heart of the DVD, but this time it is pressure and efficiency rather than combinations (though combinations are still very much in evidence). The gap between teacher and student has shrunk, so that the instruction is more like a discussion amongst peers than a lesson delivered to schoolchildren. The assumption is not only that you know the basics, but that you have an established game which you understand very well. There is a good reason why this is called Brown Belt Requirements, so I would recommend you don't tackle its contents until you're at the right level. Available to buy here, or from iTunes here and your Android device here. Full Review: When Dean released Purple Belt Requirements almost three years ago, it was one of the very few DVDs that looked beyond the early stages of BJJ. The list of DVDs aimed at intermediate and advanced students is not very long: the vast majority of instructionals cater for white and blue belts. This makes sense, as that corresponds to the demographics of jiu jitsu. It takes a long time to move through the belts, so proportionally white and blue belts make up the largest slice of the audience. However, as the sport continues to grow, there is an increasing number of advanced practitioners. You'll occasionally read on forums that 'purple is the new blue', an indication of the incredible expansion BJJ has undergone, particularly in the United States. Yet purple is also seen as the first 'teaching' belt. In other words, this is when you're supposed to have reached a certain level of maturity in BJJ. At the elite level, purple belts are supremely skilled: for example, competitors like the Miyao brothers and Keenan Cornelius, more than capable of holding their own with the average black belt. If purple opens the doors to teaching, then a brown is essentially a junior black belt. It is not unheard of for brown belts to defeat black belts at the highest levels of competition: to take the one example from recent years, Rodolfo Vieira smashed his way through the 2009 World Pro trials at brown belt, claiming numerous black belt scalps and the nickname 'Caçador dos Faixas Pretas' ("black belt hunter"). Several female world champions in the combined brown/black division gained their title while still brown belts, like Lana Stefanac, who won double gold in 2009. That means the instructional level of Brown Belt Requirements needs to be quite different from almost every other DVD set. In fact, the only real comparison is Dean's own Purple Belt Requirements. By this point, the practitioner is not normally looking to add a vast array of techniques to their arsenal. A purple belt is likely to already have a considerable store of knowledge. Therefore a DVD aimed at that market needs to do more than simply show them a few more moves. Brown Belt Requirements is split across three DVDs along with (as far as I'm aware, uniquely) an audio disc containing some of Dean's musical output (he has previously released a four CD collection, Arc and Shadow). I briefly reviewed an early version of the first disc, Pressure and Options (an hour and twenty-eight minutes), back in January of this year. I described that unfinished version as progressing to the undergraduate level of jiu jitsu, with a sense that you were sat with several other senior belts engaged in an exploratory technical exchange. I also thought it followed the same style as Purple Belt Requirements. 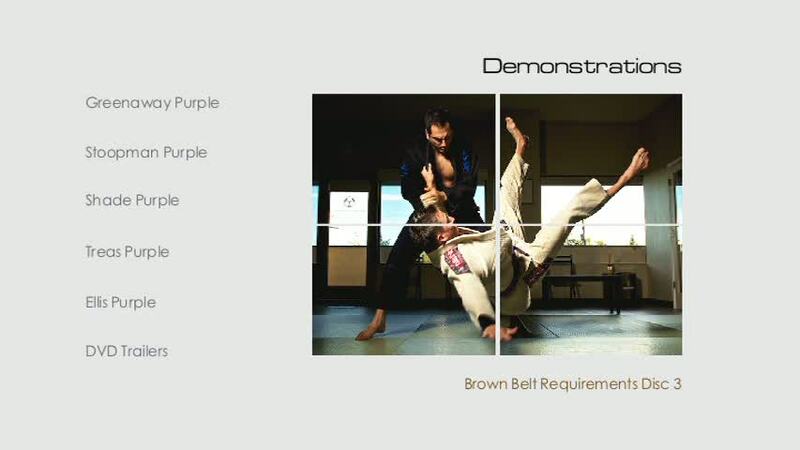 There had been a dramatic shift between Blue Belt Requirements and Purple Belt Requirements, which is far less pronounced in the progression to Brown Belt Requirements. I felt that this new DVD retains the conceptual nature of the previous release, except the focus is a little different and instructional detail is trimmed down even further. The finalised DVD version begins with a lecture on becoming a brown belt, in a similar vein to its excellent counterpart in Purple Belt Requirements, except that this new offering has a heightened sense of style. For example, Dean plays around with his voice, throwing in lots of echo. It's followed by a technical overview, running through numerous techniques, again to a soundtrack. I would assume this is a précis of everything taught on the DVD, though I can't be certain it's completely comprehensive. The orthodox introduction to the set is titled 'creating opportunity', which was closer to what I've come to expect. In Purple Belt Requirements, the key was combinations. For brown belt, Dean instead emphasises pressure from the top and bottom, which in turn means this is the belt where you become adept at submissions. Due to that pressure, you create opportunities, as per the title. Appropriately, the next section goes right into that very topic: pressure (around four minutes). First Dean runs through a few options from side control, showing how you can make some adjustments to not only increase the pressure, but potentially even elicit a tap. There are then several subdivisions of pressure, beginning with shoulder pressure. Most people reading this will be familiar with the cross-face and 'shoulder of justice'. Dean suggests ramping up the force by reaching right over to their armpit. If they bridge into you, then that helps to set up your cross-face. You can also try slapping your hand in between their shoulder blades, for greater control. He then switches to pressure from the guard, demonstrating that as they try to pass, if you can get the underhook and bump, it's possible to obtain what he calls the 'low waist position', a different kind of pressure that begins from guard and ends in side control. Finally, there is pressure from simultaneous pulling and pushing while still in the guard. This leads into leg locks, which remain an area I avoid as much as possible. However, as has always been the case with the Roy Harris lineage, leg locks are an integral part of the system, something Dean emphasises for brown belts. In 'strategic overview' (techniques with a voiceover, which I much prefer to talking heads), he notes that it is foolish to ignore 50% of the body, along with stating that lower body submissions can be a great equaliser for size and strength. I'm still solidly in the "too dangerous" camp, but perhaps I'll change my opinion in future. Dean spends roughly six minutes on straight footlocks, rolling toe holds, calf cranks and that old bugbear, heel hooks. The section on leg entanglement was particularly interesting, where Dean uses what looks reminiscent of a lockdown to prevent his opponent from rolling out of a heel hook. As one of the major reasons I don't use leg locks is that I'm terrified my partner would roll the wrong way to escape and mess up their knee, perhaps this is one way of alleviating that concern. The disc continues with top game and bottom game, where again there is a 'strategic overview' to kick things off. Dean is fond of using the metaphor of BJJ as a debate, which he extends here. For example, "Brown belt is not about learning new words, it's about adding conviction to your argument." He progresses to a rapid sequence from low mount, switching from an americana to a footlock into a triangle then an armbar. The instruction is very fast (that complex combination is explained in only three minutes), even compared to Purple Belt Requirements, which is a clear indicator of the high level practitioners this DVD is aimed towards. Top game follows, starting with 'low mount attacks', an ideal sequence for me as that's my preferred mount. A minute on 'deconstructing the choke' comes up next, then a three minute sequence with a multitude of knee-on-belly armlocks. 'Failed kimura options' caught my attention, as that's a common problem. Dean suggests a wristlock on their other hand, recovering side control, or unusually, a scissor choke on the neck. That's a submission I first saw in Gracie Jiu Jitsu Basics and had discounted, until I saw another Roy Harris black belt, Sheila Bird, using it effectively in an MMA fight. It still isn't something I'd be likely to try, but it is clearly a more potent attack than I'd assumed. Three more minutes examine the figure 4 position and the numerous attacks it provides, before a minute on what Dean dubs 'reverse knee on belly'. That opens up a transition similar to the switch from mount to side control Geeza taught recently, and fits in perfectly with Roy Dean's remarkably smooth BJJ game. Dean then moves into two minutes of knee on belly chokes, again packing lots of options into a short space of time. That starts with a methodical run-through of each choke, accompanied by a second demonstration zoomed in, to highlight the hand positioning. Dean's discussion of 'tail chokes' (by which he means using the bottom of the gi lapel) is slightly longer, at five minutes. He emphasises that once you have that grip, don't let go of the 'tail': even if your partner gets to their knees, it's still a good launching point for your offence. Their applicability in a situation when your opponent is being overly defensive looked to be useful too, as that happens frequently from mount. Like in previous sets, Dean also notes how you can use this attack to generate a reaction, which will then lead into another choke. Another two minutes are spent on reverse sidemount (which looks similar to what I'd call reverse scarf hold), including a gorgeous back take. The section closes with a few minutes on positional transitions with pressure, revisiting one of the DVD's main themes. For example, when switching from side control into a north south kimura, you can get your arm deep into their armpit using two pressures simultaneously. The sit out kimura closes off the segment on top game. That features a rare return to the basics, as Dean swiftly summarises how to use the wrestler's sit out, before adding something more offensive. As you'd expect, there is then a corresponding segment on the bottom game. Dean's introduction is based around the concept of simplicity. In the progression from purple to brown, Dean found that he simplified his techniques, trimming down the store of knowledge he had built up over the years to the essential movements. Fittingly, the first technique covered (in less than two minutes) is one of the most basic: a cross-choke from guard. However, this variation, referred to as the 'Relson choke', is slightly different. You start by coming up on your elbow to reach in as far as possible, so that your hand slides all the way around the back of their collar to the other side of their neck. Lift with your forearm to help insert your second hand, but note that it won't need to be as deep as usual. The elevator sweep takes up the next couple of minutes, from several situations, before three minutes on an overhook series. This has some similarities to the overhook attacks in Purple Belt Requirements, discussing the central attacks from that grip: choke, triangle and omoplata, along with some sweeps. There's a useful tip on kicking the legs forward to knock them to the ground for the omoplata, rather than trying to wriggle yourself into position by scooting sideways. 'Play your corner' is a more conceptual three minutes, talking about how to get into a better position to start your attack, angling off, then attempting to generate certain reactions to go for the submissions you want. That's followed by a couple of sweeps (about a minute on each). The first starts from side control when you haven't quite managed to get your leg free. The second is essentially the scissor sweep but from spider guard, using the bicep rather than your shin on their stomach. As this is a brown belt DVD, the bicep slicer isn't out of place, though given that Dean has long included heel hooks on his DVDs, the specific IBJJF restrictions have never been all that much of a concern. This set-up is from the spider guard, using the lasso, which can also flow into sweeps or you can swivel into a triangle. Finally, Dean makes a few points on adjusting the armbar from the triangle, similar to 'play your corner' from a few minutes ago. Before kicking off his next major segment on passing the guard (which takes about ten minutes), Dean talks about becoming 'a perfect student'. Interestingly, the emphasis appeared to be that you had to reach a certain base level of isometric strength, flexibility and balance. This message of 'mastering the physical' arguably contrasts a little with one of my favourite Roy Dean metaphors, from Blue Belt Requirements: you don't need a bigger gas tank, just better fuel economy. The balance part applies directly to passing the guard, where I often struggle. There's a smooth scissor sweep counter to start, using a backstep to switch direction and negate the sweep. Passing under the leg with a crushing grip on the collar moves right into a clock choke, should they try to roll out to relieve the discomfort. That includes what I know as the Felipe Souza version of the choke, bracing an elbow against their head. Passing the z-guard differs depending on if their ankles are crossed or not. If they are, Dean shows how you can wrap up their legs and sprawl to break it open. If they are not, then swivel your lower leg to bring your ankle through. The same body part is key for the 'ankle flare', by which Dean means getting that ankle over their shin as soon as you can get their knee to the floor. Sprawling on their knee is another helpful concept, before Dean gets on to a technique the DVD titles as 'toriani', again incorporating a backstep. This pass is probably one of the better examples of how confused BJJ terminology can get. I would call it the bullfighter pass, but I've seen it called all sorts of names: the toreador, toreandor, toreando, toreana, toreado...the list goes on. Google Translate tells me the Portuguese for bullfighter is 'toureiro', which like all the others will also bring up videos of the bullfighter pass. Dean completes his passing segment with the x-pass, involving a leg drag to go straight to the back. Escapes must be done in combination. [...] You should now be leading the movement with beginners, and encourage them to attempt submissions on you. Allow yourself to be vulnerable. [...] Occasional failure is the price of progress. On the road to brown belt, you've already tapped a thousand times, so don't let one more bother you. Dean then takes a minute to demonstrate a 'roll reversal', which is what he calls grabbing their arm when in turtle then rolling to take the top position. To help that roll, he suggests you should kick your leg back on the side you want to roll, as that will make it easier to spin through. Otherwise, you'll be fighting against your own base. Dean also includes the classic judo approach after having rolled them: finishing with a waki gatame. Several flowing armlock escapes take up the next minute and a half, looking to roll backwards and spin into the top position. That's followed by counters to the kneebar and ankle lock, then slightly longer on escaping side control. Dean starts with a Demian Maia style bicep bump into their head, using timing and momentum to roll the opponent. The key is to get them to commit to pushing back, as that gives you the force you need to bring them over the top. There's also a nifty wristlock you can land after tangling their arm with your legs. Coverage of mount escapes is again about a minute and a half, making some advances on the principle of trapping and rolling. Dean prefers to go directly into a footlock, a tactic you'll see on previous DVDs as well as many of the belt demonstrations. The counter to scarf hold again reminded me of Maia, as that works by pushing on their elbow just before they can secure the position, sliding out to take the back. Dean's guard pass counter uses the same principle. Another artistic piece, 'Expressing the Technique' rounds off the DVD, which as far as I can tell is the same footage from the opening lecture. 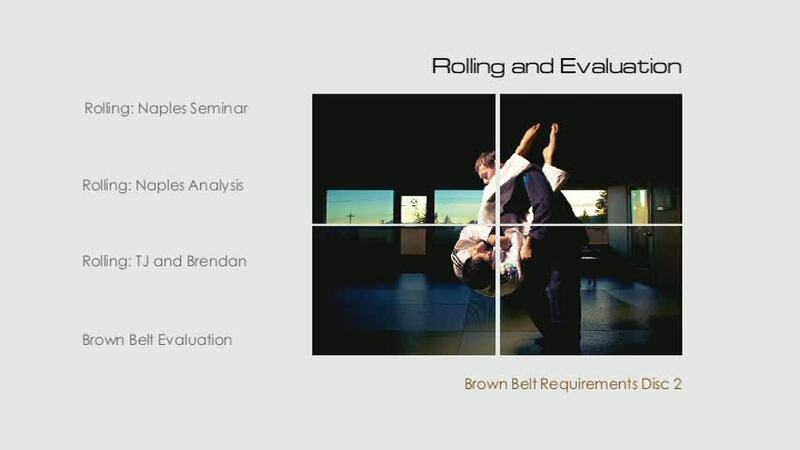 Brown Belt Requirements's second disc echoes one of my favourite parts of the previous Purple Belts Requirements: sparring footage with commentary, denoted by its title, rolling and evaluation.The first half is made up of three 'rolling' sections, 'Naples Seminar', 'Naples Analysis' and 'TJ and Brendan'. The 'Naples Seminar' section felt somewhat redundant, as it is the same footage as in 'Naples Analysis'. The difference is that the latter has commentary, along with slow motion replays for techniques and movements Dean particularly wants to emphasise. I presume the intention is that you could watch the Naples Seminar to arrive at your own conclusions, then compare that with the commentary. However, you could just turn the sound off for that: I would have preferred the option of perhaps two audio tracks, one with commentary and one without, but then I'm guessing that might be either difficult or expensive to do. Either way, the seminar itself features Dean rolling nogi against several students. They are mostly big, strong white belts, clinging on tightly as big, strong white belts tend to do (though there was at least one blue belt). Dean isn't exactly small – he's over six foot – but he is lean rather than beefy. So, there is an element of seeing how a smaller, experienced grappler should tackle muscular noobs. As Dean says, he feels that part of being a brown belt is possessing the ability to deal with a room full of beginners. The sparring also included one woman, which is good to see. 'TJ & Brendan' refers to a purple and a blue belt respectively, meaning that the commentary provides more advanced analysis this time. If you've been following Roy Dean's work, then you'll be very familiar with TJ Brodeur: he has been the main uke for many years now. The most useful aspect here is that you get to see lots of the techniques from the first DVD in action. The second half of the DVD surprised me, as it wasn't what I was expecting. The clue is in the title, Brown Belt Evaluation, split into two parts, 'The Challenge' and 'The Evaluation'. At first, you assume this is another belt demonstration, with somebody going for their brown belt. The techniques all look smooth, the demands on stamina are significant and it's all brought together by Dean's trademark musical stylings. However, from what I can gather this was not an actual test, but rather a method of ascertaining how much more needed to be done. That leads into 'The Evaluation', which for me was the highlight of the whole set. The purpose of the preceding exertion appears to have been to judge what still needed to be done to reach that brown belt level. Throughout the test, Roy Dean and his teacher Roy Harris have been watching and taking notes. The evaluation is Harris' chance to run through those notes, saying exactly what he wants to see by the time of the real demonstration in December. Harris is famously analytical, to an almost obsessive degree (a huge plus point in my book, as I love over-analysing! ;D), meaning that he can break down the task into clearly stated points. That begins with a discussion of the areas he felt were lacking, which progresses to his proposed solutions. It's a tough proposition: for example, Harris wants to see not only combinations of one or two moves, but all the way up to five. He also expects there to be a constant threat of attack, particularly from the guard, something I personally find very difficult as I have an extremely passive game. Over the course of the next fifteen minutes or so, Harris dissects the candidate's guard, side control and mount. He doesn't just talk about it, but also grabs an uke to demonstrate. This is what I love about jiu jitsu. On the one hand it's a very cerebral sport which lends itself to thorough theoretical examinations, while on the other it is also a physical exercise that requires practical demonstration and pressure testing against resistance. I hope that for Black Belt Requirements, there will be lots more commentary and evaluation, as it's a wonderful addition to an instructional DVD. The third DVD is where you'll find the belt demonstrations, something that has come to be an expected part of any Roy Dean Media production. As ever, you can find them all on YouTube, but that can't compete with the quality of a DVD version. They are also all demonstrations to earn a purple belt: I would assume that's because there haven't been enough brown belt demonstrations yet (the only one I can remember seeing is Jimmy Da Silva, though I would assume there have been at least one or two others since then). Whenever I watch a Roy Dean belt demonstration, my first thought is always "wow, I definitely wouldn't be ready for a [insert colour] belt if I trained there!" That's especially true with the purple belt demonstrations, as the rapid combinations, smooth transitions and of course leg locks are all well beyond me. You'll notice similarities between all of the demonstrations, so it would be possible for a senior student to pick up plenty of details simply by viewing this third DVD of the set. Along the same lines, my second thought is that I would love to see a DVD from Roy Dean that simply went through all the techniques expected for one of these tests: perhaps an accompanying "Curriculum" series to complement the Requirements releases. Although I assume that given the considerable variety on display as Dean's DVDs have evolved, he might well find a mere explanation of a curriculum a bit dull at this point, though I'm sure it would sell well. The third DVD finishes with some trailers. It is followed not by a DVD, but an audio CD of ambient electronica. If you like the soundtrack to Dean's work, then you should enjoy the tracks. Several of them are quite long, one going to sixteen minutes. Dean mentions in his blurb for the DVD that you could listen to the music while rolling, which would make the length understandable. I'd say that the music is closest to my favourite of Dean's four albums in his last musical release, Second Sound, rather than the harder edged End of Days. Having said that, there is a hint of industrial on certain tracks, like 'Systems Degree', but only briefly.